And so they went to Spa. Jim traditionally stayed at the Val d’Ambleve near Stavelot and did so in 1963: the 25s would be towed to and from the paddock area every day. Jim flew with Colin Chapman and Trevor Taylor on D-Day, June 6. 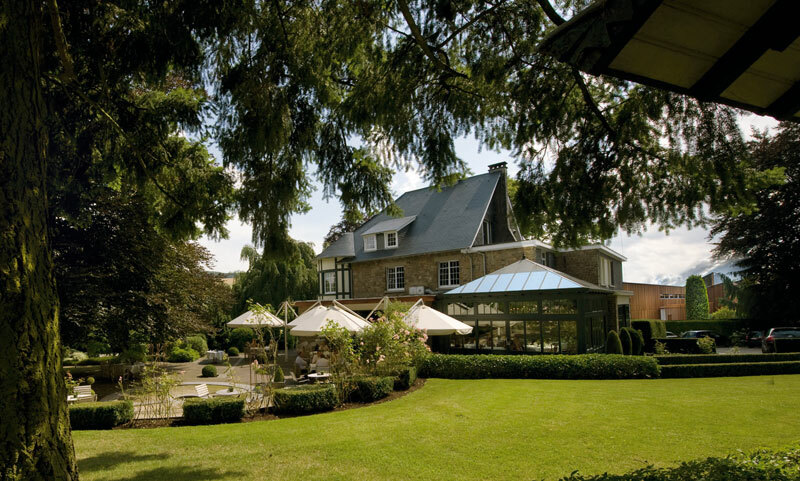 The Ardennes forest had nineteen years before been ablaze with the Battle of the Bulge. Practice at Spa would begin on Friday. In the Clark track bag: his new, dark blue Bell Magnum helmet and rounded bubble visor Bell had given to him at Indy. All previous visors used by Jim had been attached to his Herbert Johnson or Everoak helmets by a crude strap and a single stud. After last year (1962), when the rush of air down the Masta straight had actually loosened Jim’s regular white helmet peak, obliging him to rip it off one-handed whilst winning the race, Jim was delighted to see that the new Bell visor was fastened by three big pop-on studs. 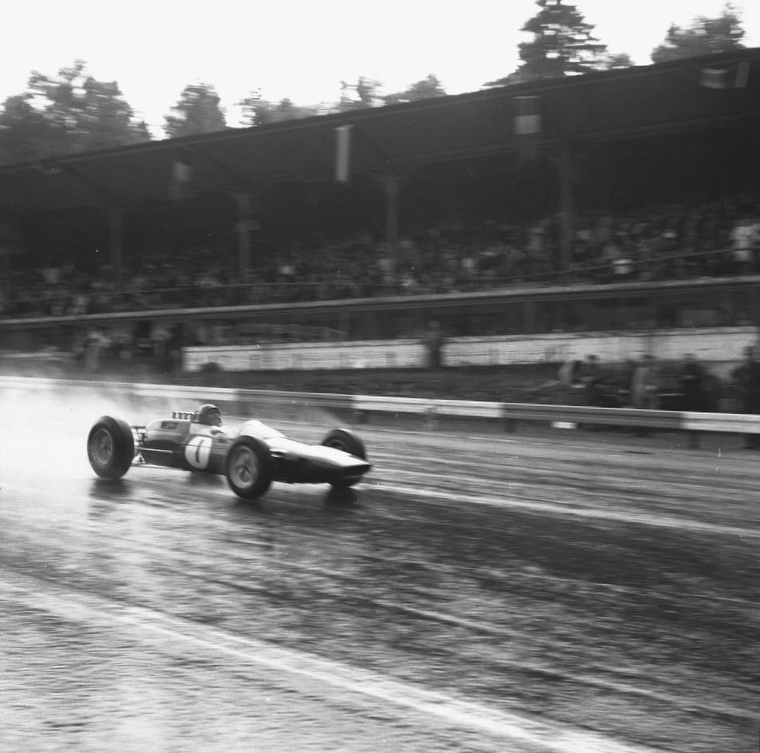 With rain always on the agenda at Spa, this would be the perfect try-out. Left in the bag, therefore, was the white Bell peak he had used at Indy, Mosport and Crystal Palace (ready for Dan Gurney to borrow!). If it was dry, he would just run the helmet without the peak. If it was wet, and providing he liked it in practice, he would try the bubble visor. Lotus had another airflow development, too: Colin’s latest idea involved a a large opening at the front of the screen and a lip on the cockpit surround. This would channel air up and over the driver, reducing buffeting and allowing the windscreen to be cut lower, thereby improving visibility. Again, the high-speed Spa circuit was the obvious venue on which to try the new device. In the dry, in 1962, Jim had won at an average of 133.98 mph – this on a lap that included a 40mph mid-corner speed at La Source hairpin. With more power from the flat-crank Climax, more grip from the Dunlop R6s and some significant re-surfacing, lap speeds – and top speeds – would be higher still in 1963. It is hard to imagine today what it was actually like at Spa back then – out there on the old circuit, on a thin ribbon of public road bordered by such routine items as telegraph poles, phone boxes, concrete marker posts, sheer drops, clusters of trees and stone-walled houses. 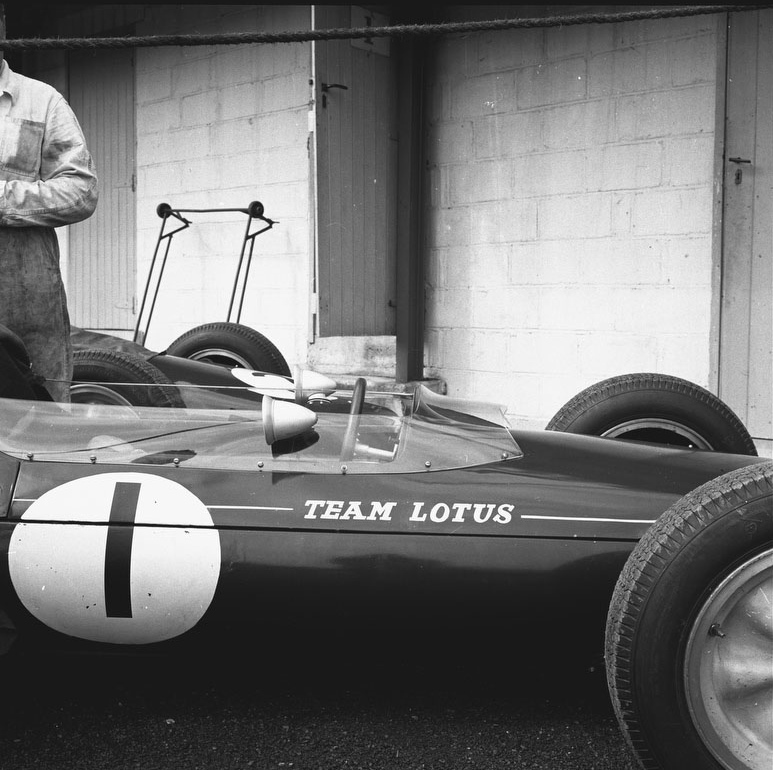 The drivers didn’t wear seat belts; the cars rattled and shook; and Jim, in the monocoque Lotus 25, was lying at about 25 deg to horizontal, his rear-vision mirrors right back near his helmet line so that he had some sort of angle of view. To see clearly in them, however, he had to turn his head consciously from side to side. This was another reason he avoided the helmet peak for Spa. The right foot was held flat, hard down on the throttle, for minutes on end, even though the road was in reality only straight into and out of La Source, down the hill past the pits and on the sections of road immediately before and after the famous Masta kink (which was also taken flat in fifth – or sixth if you were a Ferrari or Richie Ginther trying BRM’s new six-speeder). The rest of the time, the drivers were threading their F1 cars through the needle, using all the road, accelerator against the stops. The lap length was 8.76 miles and the lap time was just under four minutes – or just over it, if you were Phil Hill in the new, disastrous, ATS, or Tony Settember in the new American F1 entry – the Scirocco-BRM. After the simplicity of of the 23 at Crystal Palace, the 25 around Spa initially felt appalling. The high-speed oversteer was frightening…and still the dreaded ZF transmission kept jumping out of gear. Mid-corner. Adding to the feeling of foreboding on the circuit that Jim had hated since his first appearance there, in 1958, when Archie Scott-Brown had lost his life, and then 1960, when both Alan Stacey and Chris Bristow had been killed in Jim’s second F1 race, Trevor Taylor was also in trouble in the second 25. After finally discovering that his car had been running only on two-thirds throttle at Monaco and then in first practice at Spa, Trevor would be dispatched from the pit lane on Saturday with a rear suspension bolt still lose. Unsurprisingly, he crashed heavily when the rear wheel suddenly canted inwards. A stone marshals’ post took the impact; Trevor, amazingly, was able to step free with a badly torn thigh muscle. Hero that he was, Trevor still started the race on Sunday in the spare 25. Jim’s car felt little better on Saturday. 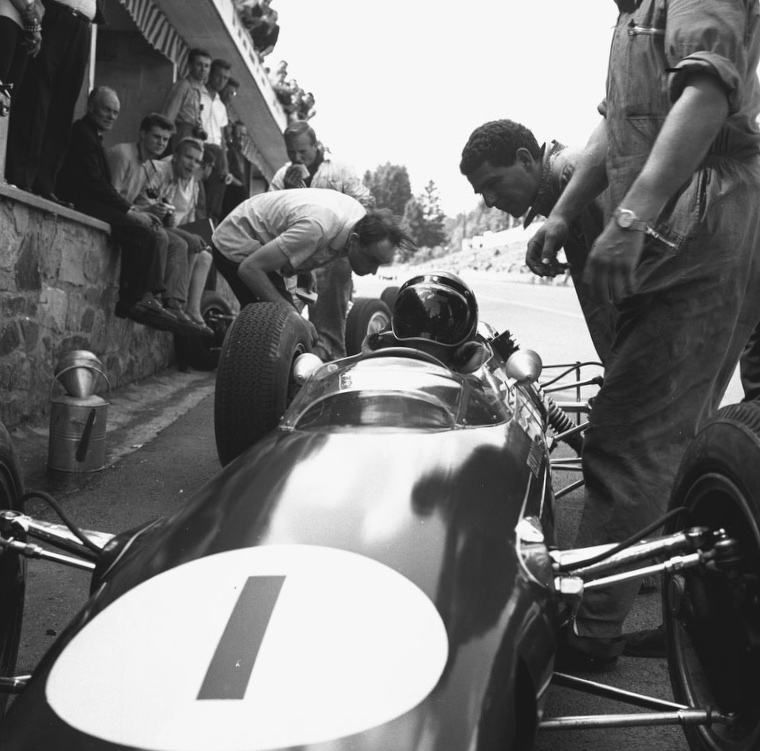 I think this was one of the first examples of Jim not giving 100 per cent until he really needed to do so: Spa was dangerous enough as it was without having to stretch the limit in practice. He would always give his maximum in the race but in practice, until he was comfortable, particularly at Spa, he would leave some margin. As a last resort, as it turned out, Cedric Selzer and the boys fitted to Jim’s car the gearbox from Trevor’s crashed 25. In between times, Jim tried the new aeroscreen (which he liked) and the bubble visor (which he didn’t); it’s convex shaped distorted his peripheral vision. He would revert, wet or dry, to his regular Panorama goggles and he would try the aeroscreen again at Zandvoort, at the Dutch GP. Jim qualified only seventh at Spa after those two days of practice. 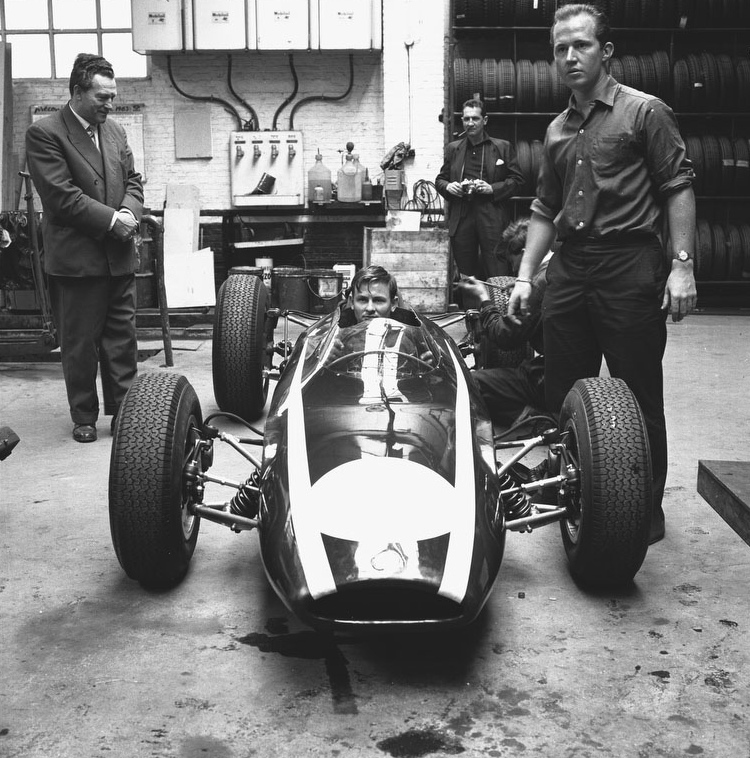 Graham Hill was on the pole for BRM, with Dan Gurney alongside him in his new Brabham. 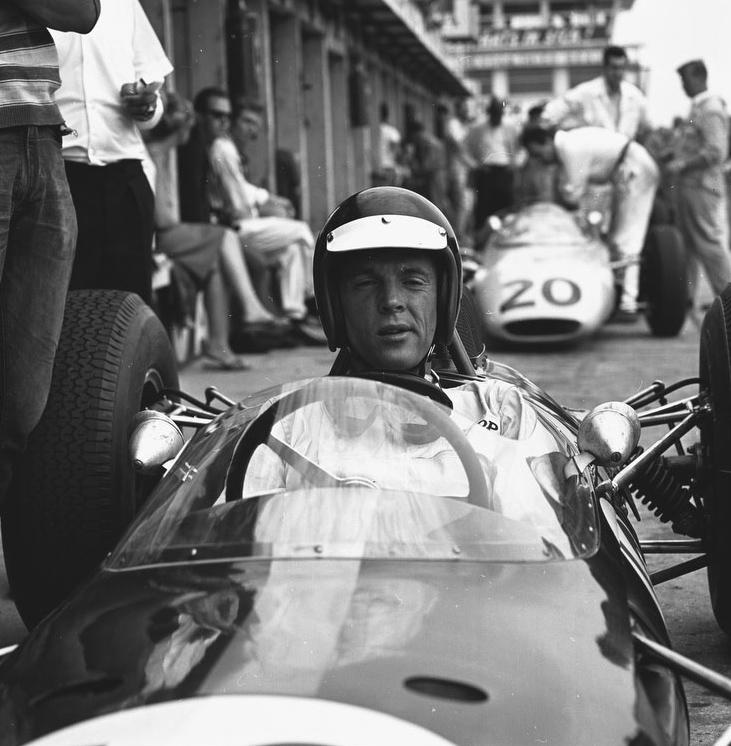 Then, third quickest, came the fiery Belgian, Willy Mairesse, playing the number two role to John Surtees at Ferrari. They formed up on a wet track. “I was right behind Willy on the grid. This set me thinking that he was inclined to be exuberant, to say the least, and that in his home race he would be rather anxious. I reasoned that a combination of an anxious Willy trying to take a Ferrari off the line in the wet at Spa was going to be exciting and that he might not take too good a job of it. I knew that if I got a good start I would have to take him on the pits side even if it meant going across the yellow baulk line. All this ran through my mind, sitting there, so that by the time the starter had raised his flag I had the Lotus on right lock and the clutch ready to bite. The flickered and came down, I let in the clutch with a bang, scooted forward and to the right of Willy, who, as I thought, was standing still with spray being sent up in the air by his spinning wheels. He just stood there without moving an inch. Mine was a legitimate start, but I didn’t expect, in my enthusiasm, to lead everyone away from the start from the front row but this is exactly what happened. 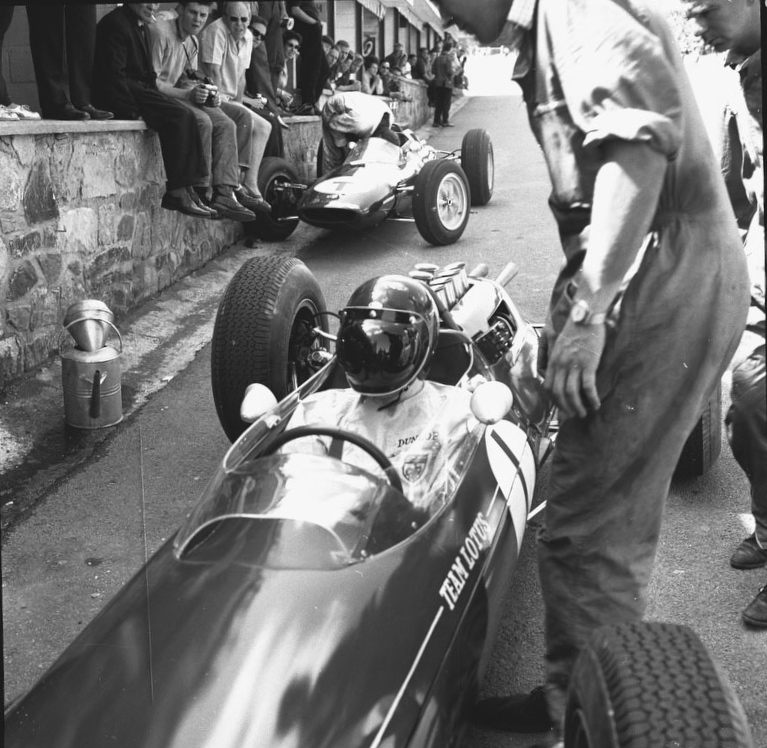 As I went into Eau Rouge I glanced in the mirror and saw Graham Hill grimly on my tail and just pressed on. As I said earlier, it was wet and I enjoy driving in the wet, but, after all, this was Spa, and I kept well within my limits. Jim still retained the lead. Graham Hill faded and then retired. As another precaution, Jim began to take fifth gear corners in fourth, luxuriating in the feel of being to hold the wheel with both hands. Then, in true John Frankenheimer fashion, the rain grew more intense. Visibility disappeared. Standing water drowned the valley. Jim added a full three minutes to his lap times..but still pulled away. Jim was relieved to win – relieved to have survived. Both Tony Rudd (BRM) and Chapman (of course) had pleaded with the organizers to stop the race; Rudd had even sprinted across the track in order to speak to the Clerk of the Course face-to-face. Their requests had been denied. Jim stepped from the 25 smeared in oil, his blue Dunlops sodden. He quickly changed into dark chinos, a polo shirt and his Pure jacket (never mind the Esso sponsorship!). On the podium, up above the old pits, by the control tower, his wet hair slicked backwards, he cradled the traditional Spa bouquet. This was the first Grand Prix he had won more than once. A cup of tea – in the Esso caravan, of course! – was very much in order. Zandvoort, two weeks later, was next on Jim’s agenda. There was at last time to return to London for a couple of days of fun – and then to see what was happening up on the farm.